"Perversity," wrote Edgar Allan Poe, is "the human thirst for self torture." Jeffrey Combs (RE-ANIMATOR) delivers an electrifying performance as the legendary writer driven to debt and drunken folly by a world cruelly indifferent to his poetry. But is it his beloved wife's agonizing death by consumption or her deranged pet feline that will soon trigger the scribe's most ghastly acts of madness? 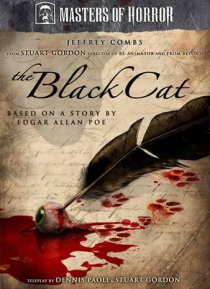 Di… rector Stuart Gordon and longtime collaborator Dennis Paoli (RE- ANIMATOR, DAGON, CASTLE FREAK) co-wrote this grisly exploration of horror fiction's dark genius, condemned to a living hell of illusion, insanity, and beyond by The Black Cat.